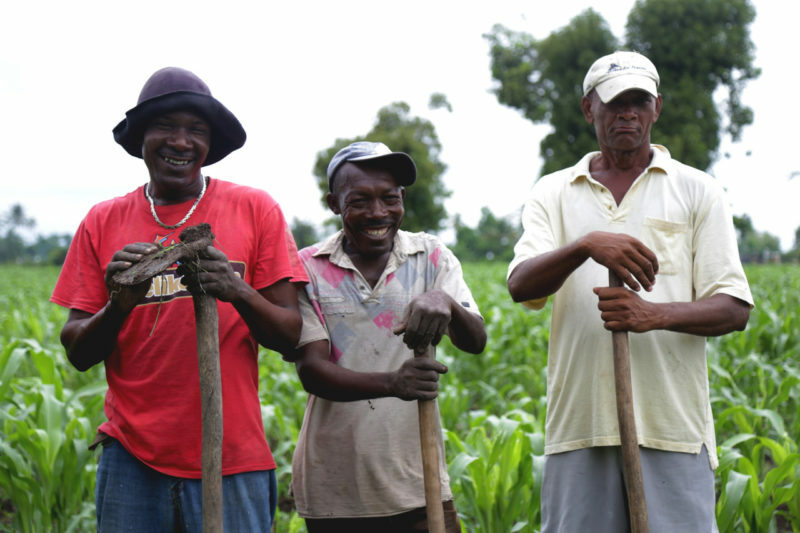 In 2013, the Brasserie Nationale d’Haïti (BRANA, a Heineken subsidiary) started the Smallholder Alliance for Sorghum in Haiti (SMASH) program to build and reinforce a local sorghum supply chain. Within its “Brewing a Better Future” sustainability strategy, Heineken pursues the development of local raw material supply to lower its costs, reduce outlays of foreign currency and to strengthen the local economy in which it operates. SMASH is a 6-year program implemented by the local Haitian firm Papyrus S.A. and co-funded by BRANA, USAID and the IDB. The program began by concentrating on training farmers and developing the supply chain. In 2018, with many smallholder farmers trained and the supply chain working more smoothly, the focus shifted to the procurement of a higher quantity and quality of sorghum from stable and relatively efficient local sources. In its first three years, all data collected for SMASH was paper-based. Field agronomists recruited suppliers (farmers) willing to work with the program, collecting information on paper in various regions across the country. They would then report to the main office mostly in hard copy, where a clerk would enter the information into a database. This process led to delays and decision-making was often frustratingly uninformed, resulting in potential infestations of crops going unreported for weeks among other negative impacts. In 2016, SMASH partnered with RTI International and Dimagi to develop SMASH Mobil, an integrated mobile technology and reporting system, to support actors across the value chain. The objective was to mitigate the discrepancy between what was happening in the field and what was being reported, but also to support key monitoring and evaluation efforts. The tool, supported by the CommCare platform, runs on Android tablets and helps the program monitor its progress in near real time, from land preparation and planting all the way to the delivery of grain to BRANA. This part of the app also records follow-up field visits and technical support, and tracks progress and deficiencies of the registered plots. This feature helps field agronomists maintain a steady relationship with suppliers by offering ways to monitor their crops and maintain fields in optimal health. The app also helps to detect crop infestations at an early stage to avoid damage and mitigate loss of production. Within this part of the application, every interaction with the supplier is tracked from seed delivery through the different stages of the plots leading up to harvest. After a purchase is made, the application is used to track the sorghum from the time it is loaded onto the truck for transportation to the conditioning center. It tracks the amount of sorghum harvested, the balance to be paid to the supplier, and the logistics data from the time of the purchase to the delivery of the final product to BRANA. Between SRM and SCM, the SMASH Mobil application tracks the entire sorghum life cycle, from its planting at the farm all the way to BRANA’s brew house. All the data is aggregated and put in perspective for monitoring and evaluation using an interactive Tableau dashboard and CommCare’s built-in reports. This real-time presentation of data allows supervisors, program management, and shareholders to monitor the progress of the team in the field. Data collected by mobile users is transferred in almost real time to this dashboard for visualization. To ensure smooth adoption of the app, SMASH had to build a few support resources. The first is a workflow tool to visualize and describe the flow of the information throughout the various modules. This tool gives new users a quick glimpse of how to navigate the application for a specific task. Next, a quick-start guide presents users with a step-by-step process on how to navigate through the modules and forms within the application. This tool has proven very helpful for new and intermediate users. To successfully achieve the goals of the training sessions, it was helpful to adapt the approach to the audience. Instead of a standard presentation consisting of slides and talking about the process of filling out forms, the app itself was mirrored on a screen for the whole team to follow. As new users were navigating through the app themselves, they could follow the flows in real time, and pause the presentation at any time to ask questions. Regular practical training sessions were held with new users to guide and support them through the process of using the application. Working directly with mobile users in the field while providing guidance was a key part of the rollout of the application. Walking users through the modules was a very good introduction, but the key to the rollout’s success was the on-site assistance, where immediate support was provided to tackle the unanticipated faced by users. From the very beginning, SMASH Mobil focused on helping increase sorghum yields on smallholder farms by implementing the agricultural techniques included in the application such as regular field visits and early detection of infestations. In turn, increased yields increase the amount of sorghum purchased through the app, which increases incomes of smallholder farmers. This improved supplier relationship creates an economical, stable and durable supply chain of local sorghum for BRANA. In the years to come, SMASH and BRANA will continue to closely monitor and improve overall performance to support its field teams, local farmers and guarantee a high-quality and 100% local product.